LAKE MARY, FL-(September 1st, 2015)-Fonon Corporation (“Fonon”) is pleased to announce next-generation technology integrated into the company’s flagship high-volume, industrial-grade 5-axis deep-engraving system. 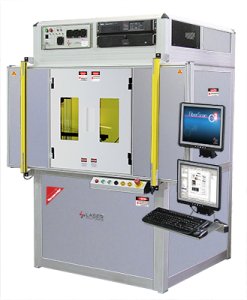 The LaserTower™ Professional MegaCenter’s oversized processing chamber is 42” x 42” incorporating zero-friction DDMS technology to float the laser effortlessly across the working surface area. Integrated with a 50W Q-Switched Fiber Laser, deep-engraving applications can be processed in large volume batches. All Direct Parts Marking (DPM), including UDI/UID barcodes, logos and engravings are permanent, legible and non-removable. Not to be confused with flying optics technology that incorporate belts, pulleys and ball-screws, zero-friction DDMS technology is magnetic based requiring no maintenance. Fonon is the only laser-based subtractive materials processing system supplier to incorporate leading-edge DDMS technology continuing to set industry benchmarks in quality of workmanship for high-volume marking and deep-engraving applications.